A family-owned and operated company, Rays Reproductions has been satisfying the needs of clients for more than 30 years. Since inception, we have been committed to providing exceptional quality design and printing at the lowest possible cost, and to providing our clients with the best possible service and services. 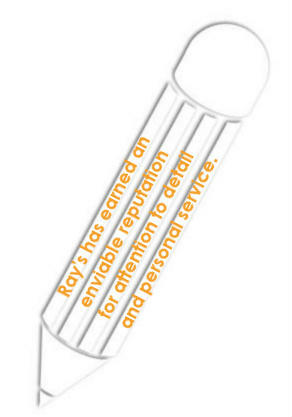 Over the years, Rays has earned an enviable reputation for attention to detail and personal service. Rays offers a full range of design, printing, finishing and duplication services. With a proven track record, a professional staff and state-of-the-art equipment, you can be confident of unmatched performance. It is said that a picture is worth a thousand words. At Rays we believe that creative graphics are worth more than a thousand words. From a single page one-color flyer to a full blown four-color Corporate Identity and Marketing program, our Design Team will create a look as unique as you are. Your entire project is controlled in our Westwood, New Jersey facility, from initial design and layout stages right through printing and finishing. In a word, we take your entire project from Concept to Reality. I would be pleased to meet with you at your convenience to discuss the work we do at Rays and tell you how we can provide both design and print services for a very competitive price.